The lower western South Carolina campus for the University of South Carolina opened in 1965 following the expressed desire for a local college to serve the residents of Allendale, Bamberg, and Hampton counties. Subsequently, the Western Carolina Higher Education Commission was established by the state legislature, consisting of two appointed members representing each of the aforementioned counties. By 1984 neighboring Barnwell and Colleton counties were also represented on the commission. 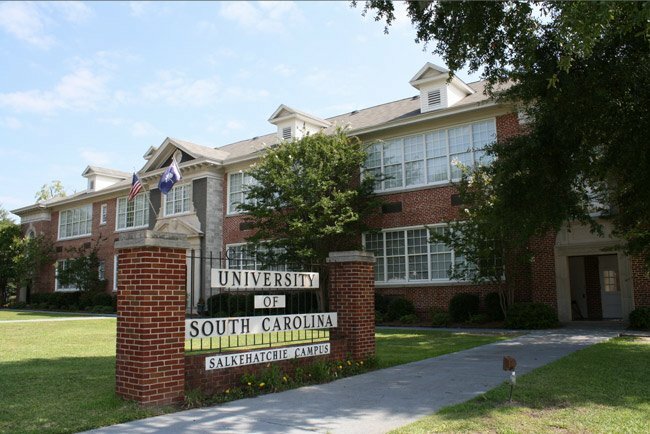 The campus was named USC Salkehatchie for the Salkehatchie River, which flows through the counties served by the school. The school received its first students in a former elementary school building, seen above. Over the years, the college has amassed several more buildings as well as another campus, deemed East Campus, which opened in Walterboro in 1979. The original Allendale campus is referred to as West Campus. Now occupying 14 buildings on the two sites, the college has plans to expand by adding a new Science and Technology building on the West Campus. USC Salkehatchie offers an Associate’s Degree in Science as well as an Associate’s Degree in Liberal Arts. It also has four-year degree programs in nursing and elementary education.